New pathway to tackling overweight children supports parents with relevant, realistic and achievable One Daily Win approach. Thursday 2 November 2017: A major new five-year public health awareness campaign to set families - and in particular, children - on the path to a healthier future has been launched today by a multi-agency grouping of safefood, the Department of Health and the Public Health Agency. 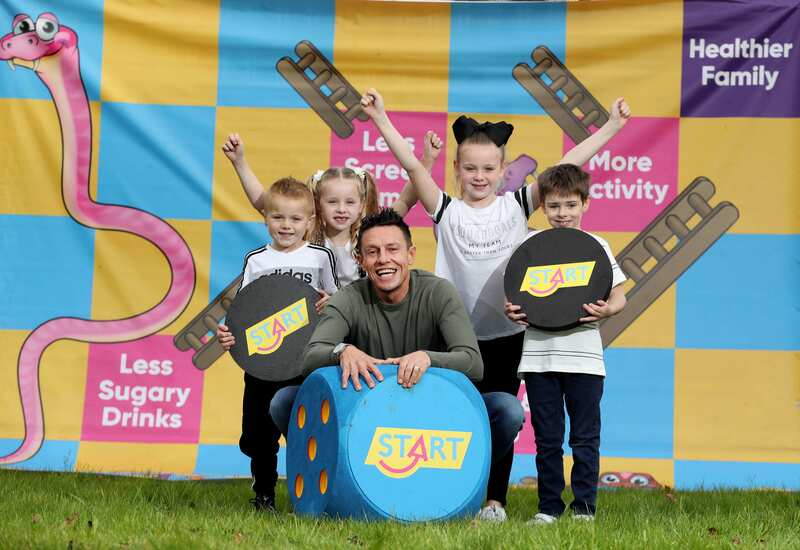 With a quarter of children in Northern Ireland aged 2-15 years reported recently as being overweight (17%) or obese (8%)*, the new “START” campaign is set to take a fresh approach to tackling an issue which continues to stack up serious health problems for the next generation. The START campaign has been developed with the input of parents, health professionals and community educators. It takes a realistic and practical approach which acknowledges that the solutions to tackling overweight and obesity are many, that even small steps can add up to a big result and that every sector has a role to play in addressing this important health issue. Through multi-layered implementation, the campaign recognises that a society-wide movement is needed to inspire and support parents in their efforts to adopt and stick to healthy lifestyle habits. START seeks to help families in taking that first step and ongoing steps for their children’s health by starting with one daily win, and encouraging them to persist, no matter how often life and the environment intervenes to derail their efforts. The habits it wants parents to adopt are clear and simple: drink water with meals; add fruit and / or vegetables to meals and snacks; limit sweet treats to occasions; cut down on screen time; give children child-sized portions and plenty of play / activity and sleep time. A half hour less of screen time daily is a win. Moving from two pieces of fruit and veg a day to three is a win. Confining sweet breakfast cereals to the weekend is progress. Providing families with support and practical advice to help build their confidence in making positive changes to their lives. Delivering a consistent approach across all relevant sectors including schools, hospitals and GP surgeries. Supporting sustainable communities and tapping into existing community health programmes. Tackling the societal and environmental factors which support obesity, by driving for change through key policy initiatives. Caroline Bloomfield, Health and Social Wellbeing Improvement Senior Manager, Public Health Agency, said: “We have made a good start working in schools and other early years settings in beginning to address the issues of childhood obesity and, as this work continues, we’re asking parents to get on board and make small daily changes to help get our kids on the road to healthier living. To find out more about the campaign, visit here.